Chair and Associate Professor of Political Science and International Relations, and Associate Professor of Women’s and Gender Studies at Simmons University in Boston, MA, USA. Author of Democratic Governance and Social Entrepreneurship: Civic Participation and the Future of Democracy (Routledge 2013) and Women, Civil Society and the Geopolitics of Democratization (Routledge 2010). Visiting Assistant Professor of Political Science at the University of Bridgeport’s School of Public and International Affairs. 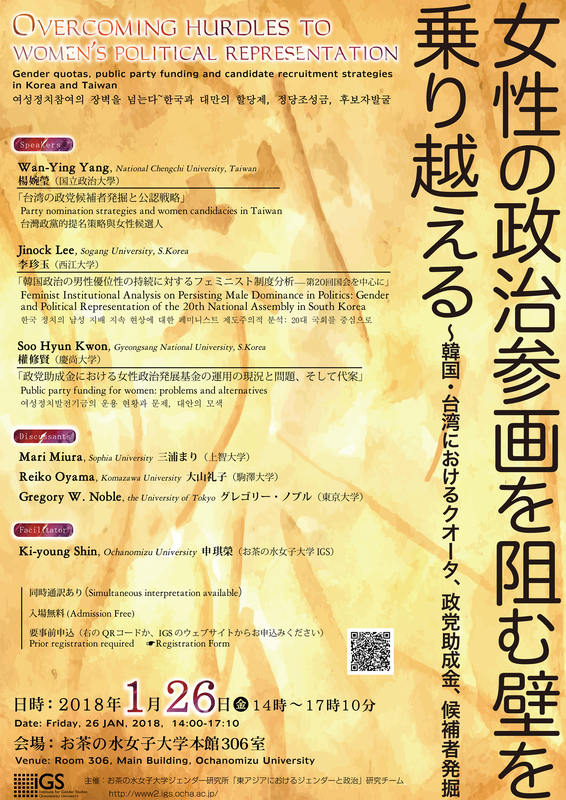 Research Interests in Japan’s gender politics and the movements seeking justice for comfort women in the US. 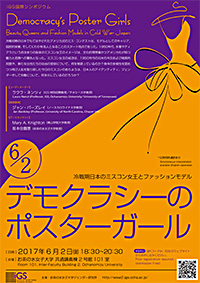 Member of the Maureen and Mike Mansfield Foundation’s Network for the Future US-Japan Alliance, cohort II. Associate professor of politics and international relations at Drake University, USA. 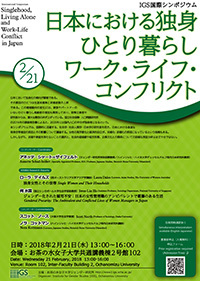 Editor of the Routledge Handbook of Japanese Foreign Policy. 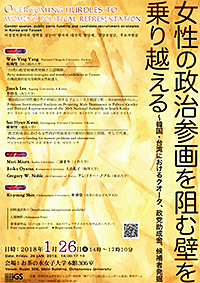 Most recent publication is “Coalition Building and Mobilization: Case Studies of the Comfort Women Memorials in the United States,” with Linda C. Hasunuma (Politics, Groups, and Identities, 2018). Women’s transgressive behaviors and perspectives are challenging societal norms in the Arab world, giving rise to anxiety and public debate. How do both intentional and unintentional transgressions illuminate the social and cultural constructs that define proper and improper behavior? How do they expose the social and political policing of gender, racial, and class divisions? The new book Bad Girls of the Arab World engages these questions by examining the experiences of women from a range of ages, classes, and educational backgrounds who live in the Arab world and beyond. The book demonstrates that women’s transgression is both an agent and a symptom of change, a site of both resistance and repression. Showing how transnational forces as well as the legacy of colonialism shape women’s badness, Bad Girls of the Arab World offers a rich portrait of women’s varied experiences at the boundaries of propriety in the twenty-first century. At their presentations to the IGS Symposium Bad Girls of the Arab World co-editor Nadia Yaqub and contributor Diya Abdo continue this discussion, exploring the politics of women’s transgression, identity, and belonging in the Arab world and beyond. My talk will focus on concepts that structure the book Bad Girls of the Arab World that I edited with the late Dr. Rula Quawas, and the various approaches that our contributors have taken to those concepts. I will explain why we chose to focus on transgression, how transgression differs from resistance, and what insights can be achieved through a multi-disciplinary approach to transgression. 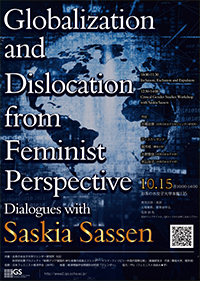 I conclude by considering the implications of transgression: How does transgression alter the intimate social connections created and sustained by women’s traditional work? How do women’s care for the home, nurturing of people, and collective food rituals offer creative modes for resistance? While such work is fundamental to social relations and cultural transmission, it is always also fraught, encompassing coercion and constraint as well as love and connection. It is also a site of continued, if at times almost invisible, transgression. In this creative nonfiction/memoir piece, I detail my experiences in the U.S. and in Jordan as a western-trained academic who found it difficult to feel at home in either a post 9/11 America or conservative Jordanian institutions. These two different contexts’ various and competing expectations of Arab and Muslim women scholars and activists meant that I had to walk a constant tightrope lest I be considered anti-Arab and anti-Muslim in Jordan or anti-woman in the U.S. Even as I attempted to strategically navigate my feminism with my nationalism, my womanhood with my Arabness, my feminist longings with my postcolonial condition, it was impossible to be deemed “good” in either location. This led to painful exile and erasure. Through my experiences with my students, my children and the refugees I support through my program Every Campus A Refuge, I have found ways to make a home between cultures and to engage in these struggles in productive and meaningful ways. Development of women’s political leadership has been an important social agenda not only in Japan but also in countries and regions all over the world. Encouraging the young generation, such as high school and university students, to participate in politics and providing leadership training for them can be an effective way to achieve this. 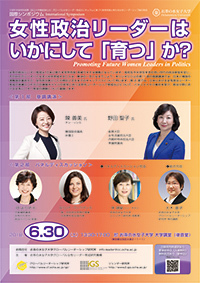 In the first session of this symposium, two female national parliament members from Japan and South Korea will deliver keynote speeches about their career experiences. 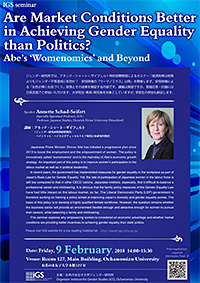 The following panel discussion session takes up issues of women’s political leadership education, starting with the panellists’ reports on the achievement and challenges of Japanese women’s political leader education and on young political leader training in the German Social-Democratic Party. 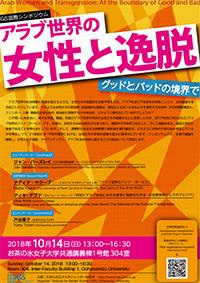 Japan has been showing a marked trend toward developing into a single society. One of the causes for this trend is an increase in the proportion of never-married persons, and of persons who do not intend to ever marry. These changes in marriage behavior have raised grave concerns among policymakers and scholars as this trend is correlated with the probability of living alone in old age, i.e., without a partner or family. According to a survey report published by the National Institute of Population and Social Security Research in 2016, it was estimated that half of the population in Japan will be single by 2035. 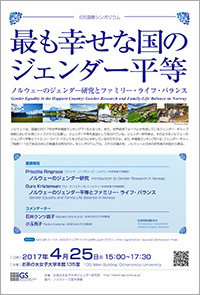 The symposium invites international scholars of expertise in sociology, social anthropology and Japanese studies to present the causes and potential consequences of the dramatic rise of solo living in Japan. It has been assumed that higher education levels and growing economic independence of women have triggered a society in which fewer marriages take place. However, detailed empirical analyses of relationships between avoiding marriage or union formation and social values, working patterns, or corporate culture are still limited. Eric Klinenberg Living single. (Klinenberg discusses his book ‚Going solo’on youtube, 21 min.). Post date 2013.11.13. Video Report: Super-Solo Society—Changing Japanese Views on Marriage (Mr. Kazuhisa Arakawa, Hakuhodo Solo Activity Men Research Project Leader). 1h 45 min press briefing Foreign Press Center Japan. Post date 2017.06.29. Soraya Tremayne, Founding Director, Fertility and Reproduction Studies Group, University of Oxford. 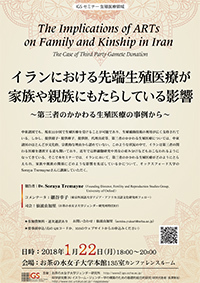 Sachiko Hosoya, Research Fellow, Research Institute for Languages and Cultures of Asia and Africa, Tokyo University of Foreign Studies. Yukari Semba, Project Research Fellow, IGS, Ochanomizu University. Is there a right size to history? How large does an event or a person must be in order to be included in a history book? Do we need to uncover the small worlds of individuals whose inconsequential actions did not change the historical process? 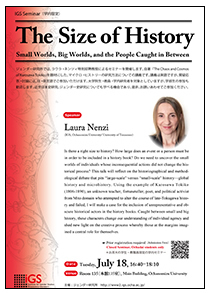 This talk will reflect on the historiographical and methodological debate that pits “large-scale” versus “small-scale” history—global history and microhistory. Using the example of Kurosawa Tokiko (1806-1890), an unknown teacher, fortuneteller, poet, and political activist from Mito domain who attempted to alter the course of late-Tokugawa history and failed, I will make a case for the inclusion of unrepresentative and obscure historical actors in the history books. Caught between small and big history, these characters change our understanding of individual agency and shed new light on the creative process whereby those at the margins imagined a central role for themselves. Big business in early Cold War Japan, American-style beauty pageants launched modeling careers, national heroes, and overnight celebrity. The beauty queen’s iconic uniforms from swimsuit to tiara shaped her as a cultural figure and a cautionary tale about the allure and dangers of Americanization in 1950s Japan. 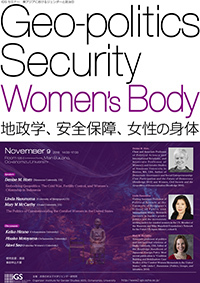 What do her victories tell us about Japan-U.S. diplomatic and commercial alliances and attitudes toward women’s new freedoms in the 1950s? Popular again in Japan, but including a broader range of bodies, what do today’s beauty pageants signal about notions of Japanese identity, gender, and labor?